Pen Prado has a passion for cooking. Specifically, cooking her father’s food in her father’s restaurant. It’s the heart of their immigrant neighborhood, a place where everyone belongs, and second chances are always on the menu. Except for Pen. Despite the fact that there’s something almost magic about her food, her father can’t imagine anything worse than her following in his footsteps. And when Pen confesses to keeping a secret from her family, he fires her, ensuring she never will. Xander Amaro is undocumented but that doesn’t stop Ignacio Prado from offering him a job at his restaurant. For Xander, it’s a chance to make amends and to sever his toxic relationship with the druglord, El Cantil–a man whose been like a father to him since his own disappeared. Soon after, his mother abandoned him too, leaving behind a void that not even his abuelo can fill. Until he meets Pen. Both seeking a place where they feel like they truly belong, they end up finding each other, and in the face of tremendous fear and self-doubt, they end up finding themselves. 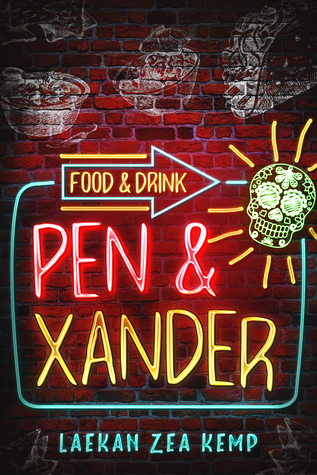 Request a copy of Pen & Xander here! The parking lot hasn’t changed; the science building looks the same as that first day of school five months ago. But as I sit in my car, watching girls I met during orientation skip up the steps, hugging their bags, excited to play nurse, I try to convince myself that something inside me has. That today I’ll actually be able to go inside. That today I will stop lying and be the person they want me to be. Class starts in approximately seven minutes—the class I should have taken and passed last semester, moving me one step closer to a degree in nursing. I sit in the parking lot, watching the clock tick down. The car is in park but I can’t bring myself to turn off the engine. I turn off the car, reminding myself how much I’ve already wasted on tuition and books. You can do this. You can. I reach for my bag. Get. Out. Of. The. Car. And then I can’t breathe. All I can think about are my mother’s shoes. How they’ve sat in the same spot by the door for almost twenty years. Scuffed and cracked, the shadow of her foot pressed to the leather even when the laces are loose. I imagine every hallway they’ve ever walked down, every door they’ve propped open, every mess they’ve ever stepped in, every second they’ve held her up when all she wanted was to collapse. Because one of her patients couldn’t remember her face or their daughter’s name or how to speak. When she lost one I’d wake to the knock of the rolling pin and the smell of dough warming on the hot plate. Sometimes I’d try to take the pin from her but there was something about the force, about the rhythm that reminded her how to breathe. We’d work in silence and three-dozen tortillas later she’d wrap them in foil and drive them to the family. The family that only visited once a month. That would accept my mother’s food without acknowledging that she was more family to the deceased than they were. And then the next day she would go back to work. For almost twenty years. She went back. And if I step out of this car, if I walk up those steps, if I sit at that desk and pretend…how long will I be sitting there before I realize I’m trapped? I take a deep breath, the scent of a thousand shifts at the restaurant tucked into the fabric of the front seat. Mango and cilantro and epazote, tomatillos and roasted pepitas and tortillas. I can’t sleep without those smells tangled in my hair, without those flavors still on my tongue. So I have to decide what’s scarier: living a life that doesn’t belong to me or losing the one I love. If the truth breaks my father’s heart, I know he’ll take it from me. But if it doesn’t, if he understands, if I can make him understand, I can be free. I weigh each option, simmering in the anxiety they provoke, in the hope. Because I have to do what scares me. It’s the only way to ward off the helplessness. To stay in control. I always have to be in control. Which means that today is not the day I go inside. My stomach drops, my hand reaching to put the car in drive again. Today is the day I tell them the truth. Laekan is a writer and explorer extraordinaire who grew up in the flatlands of West Texas. She graduated from Texas Tech with a BA in Creative Writing and is the author of the multi-cultural New Adult novels The Things They Didn't Bury, Orphans of Paradise, Breathing Ghosts, and the Young Adult Paranormal series The Girl In Between. Her upcoming contemporary romance is slated for release during the summer of 2017!